In his early 20s he founded the most influential clubnight of its time, ‘Trash’ in London, where he played weekly alongside the likes of LCD Soundsystem, Klaxons, Bloc Party, Peaches & Yeah Yeah Yeahs. Over the last decade the world’s dancefloors have been rocked by Erol’s remixes (for Klaxons, Hot Chip, Scissor Sisters, Alter Ego, Mylo, Bloc Party, DFA1979, Chemical Brothers & Franz Ferdinand); with Erol being voted Mixmag’s ‘DJ Of The Year’ and ‘Best International Dj’ and even being called up to support both Madonna and Daft Punk! Erol’s label ‘Phantasy Sound’ has put out tracks from Chilly Gonzales, Riton, Primary 1, Boris Dlugosch & Late Of The Pier; and to date Alkan has acted as album producer for Late Of The Pier, Mystery Jets & The Long Blondes. More recently he has released his collaborations with Boys Noize ‘Waves/Deathwave’ & ‘Avalanche/Lemonade’ - both of which have been picked up by the world’s top DJs. Add to this the warped balearic psychedelic brotherhood of ‘Beyond The Wizards Sleeve’ and his work as the mysterious 'Mustapha3000'. Until you’ve borne witness to one of his legendary DJ sets, poured headily over one of his meticulously crafted productions, or been catapulted to a sudden sonic nirvana by the dropping of one of his remixes, you might be justified for dismissing his existence as an extremely elaborate myth of the musical underground. After all, how can one man, still in his early thirties, have kept so many kids dancing for so long? Tickets : Alt-Tickets or Fatsoma. 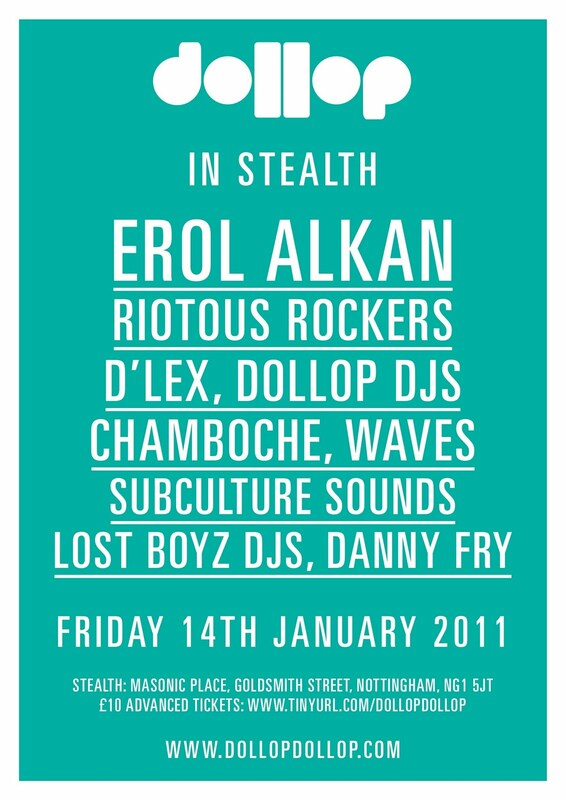 Check out the Facebook events by Stealth & dollop. For more info join the dollop Nottingham Facebook Group.